Tournament may be limited to the first 60 players. Early registration by mail or in person is recommended. This tournament, made possible through the generosity of Mr. Sidney Belzberg, has been named after lifelong chess lover Donald Benge who was tragically killed in a car accident, caused by a drunk driver, on April 6th, 2007. Over the weekend, I took these pictures during the New York March Open, at the Marshall Chess Club. You will see Class A players David Spigel and Ed Kopiecki, as well as IM Jay Bonin and Christopher Wu. Yesterday, at the Marshall Chess Club, a celebrity played in section 2 of the New York March Open. Can you identify him from the pictures below? I finished the New York March Open, at the Marshall Chess Club, with a score of 2-0-2. 50.Bf5+ Kd8 51.Ke2 Bf4 52.Kd3 Ke8 53.Kc4 Rd8 54.Kd5 Rxd6+ 55.Rxd6 Bxd6 56.Kxd6 Kf7 57.Kxc5 Kg7 58.Kd6 Kf6 59.Be4 Kg7 60.Ke7 Kh8 61.Kf6 Kg8 62.Kg5 Kg7 63.Kxh4 Kh8 64.Kg5 Kg7 65.Bd5 Kh8, draw. 15.Nxe7+ Qxe7 16.Rxf8+ Kxf8 17.Nb6 Ra7 18.Nd7+ Nxd7 19.Bxa7 Ndc5 20.Qd4 Nxb3 21.axb3 e5 22.Qb6 d4 23.Bb8 Kg8 24.Rf1 Nc5 25.Bd6 Qg5 26.Rf8#. Earlier today, I played these games in the New York March Open at the Marshall Chess Club. 48.Be8 Ne6 49.Bxg6 Nxg5 50.Bf5+ Kb8 51.Kc5 Ka7 52.Kb5 Nf7 53.Kc5 Ka6 54.Bc8 Kxa5 55.Bxb7 Ng5 56.Kd5 Nxe4, draw. 33.Qh3 Qf6 34.Rb2 Ba5 35.Ra7+ R6e7 36.Ra6 Qg5 37.Kg2 Nh6 38.Rb5 Ng4 39.Raxa5 bxa5 40.Rxc5 Re5 41.Rc7+ R8e7 42.Rc8 Rxe2 43.Bxe2 Rxe2 44.Rc7+ Kg8 45.Rc8+ Kf7, White resigns. Open: GM Alex Lenderman [pictured above], GM Gennady Sagalchik, GM Mikheil Kekelidze, IM Bryan Smith, FM Victor Shen, NM Peter Minear, NM Leroy Dubeck, Michael Katz, NM Andrew Shvartsman, Andrew Ng, Arthur Shen, Jeremiah Williams, Dave Repici, Lawrence "Muskee" Books, Gennadiy Geyler, Anthony Norris, and Nate Kolo. U1800: Dan Herman, Alex Shestyan, Don Battle, James Tuzeneu, David Willenbring, Chris Anderson, and Tarik Bittout. March 27th Greater Cherry Hill Super Saturday Grand Prix: 5SS. Game 30. OPEN SECTION: 1st $450, 2nd $300, 3rd $150. U2000 $100. SECTION 2: U1800 1st $125, 2nd $75, 3rd $50. FIRST 5 GMs and IMs PRE-REGISTER FREE! ($50 deducted from winnings). EF online: $50 by 3/15, after 3/15 $60. $70 ONSITE. Register at http://www.greaterchchess.com/ . Cherry Hill Library Conference room from 10 a.m. to 5 p.m.
Mackenzie Molner of New Jersey has earned his final norm for the title of international master. On Saturday March 13th, David Cole gave a simultaneous exhibition in Sparta NJ. Here is an account of the event from Chess Life Online. 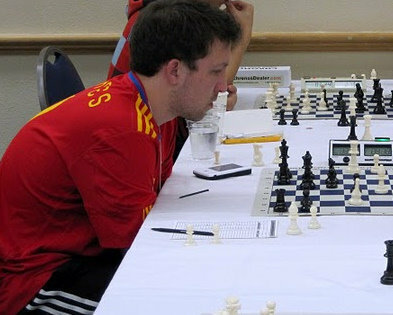 International master Dean Ippolito [pictured above] proved them wrong by winning the FIDE section in the Only New Jersey Championship, at the Dean of Chess Academy, with a perfect score of 4 points. Dean defeated me, NM David Grasso, IM Mikhail Zlotnikov, and Christopher Wu. Below are more photos that I took on Sunday. On Sunday, I played the following games in the Only New Jersey Championship, at the Dean of Chess Academy. I finished the tournament with a score of 1-1-2. 48.Nb3 Bf1+ 49.Kc2 Bb6 50.Nd2 Be2 51.Kb3 Ba5 52.Kc2 Kd5 53.Bxd4 Kxd4 54.Nb3+ Ke3 55.Nxa5 Kf2 56.Nc6 Kxg3 57.Nd4 Bf1 58.Nf5+ Kf4 59.Ng7 Kg4 60.a4 bxa4 61.Nxh5, draw. 19.Bxb7 Rxb7 20.Rd5 b5 21.Rxe5 dxe5 22.Rd1 Kf8 23.c5 Ke8 24.Kf1 f6 25.Ke2 a4 26.b4 Rb8, draw. Here are the games that I played on Saturday in the Only New Jersey Championship, at the Dean of Chess Academy. 68.Ke5 Kh6 69.Kd6 a3 70.bxa3 Be8 71.Kc5 Bd7 72.Kb4 Be8 73.Be2 Bc6 74.Bb5 Bf3 75.a4 Kh5 76.a5 Kxh4 77.a6 Kg5 78.Kc5 Kf6 79.Bc6, Black resigns. 13.h3 Be6 14.Qd2 Ne4 15.Qd1 Ne7 16.Re1 Ng6 17.Bh2 f5 18.Ne5 Qf6 19.Qh5 Kh7 20.Nxg6 Qxg6 21.Qxg6+ Kxg6 22.f3 Ng5 23.h4 Rae8 24.hxg5 hxg5 25.g4, Black resigns. Earlier today, I snapped these photos during day one of the Only New Jersey Championship, at the Dean of Chess Academy. Carlsen Interview in "Der Spiegel"
Kasparov Criticizes Obama in "WSJ"